We’re starting the year off in the right way – with an incredible Guerlain launch! The Guerlain Happy Rosy Glow Makeup Look for spring 2017 is a celebratory collection for two very big reasons. Firstly, it marks 30 years since the launch of the original Meteorites Pearls. And secondly, the collection is completely exclusive to Escentual! Inspired by the incredible radiance that Meteorites gives to the complexion, Guerlain Happy Rosy Glow presents four limited edition pieces that are all about boosting a natural, rosy glow. The centrepiece of the collection is a showstopping pot of Happy Glow Meteorites Pearls (the stuff collectors’ dreams are made of), which bathes the complexion in light. For cheeks there is the Meteorites Happy Glow Blush, the first ever pressed Meteorites blusher from Guerlain, while lips are kissed with two new rosy hues of KissKiss lipstick. The ultimate radiance booster has an absolutely beautiful new guise for spring 2017. The limited edition Guerlain Meteorites Happy Glow Pearls arrive not in the traditional Guerlain metal pot, but in a pearlescent sphere reminiscent of a giant powder pearl. Unscrew the lid and you’ll find a fluffy pink puffer, and a brand new Meteorites colourway that celebrates the freshness of spring. The most notable difference with this new colourway is the inclusion of large ‘Rainbow Glow’ pearls, which give skin an iridescent sheen that’s a little pink, a little golden, and completely flattering. These new pearls are joined by brightening champagne, refreshing pink and colour-correcting mauve, which neutralises yellow tones in the skin. It’s fair to say that the quintessential Guerlain glow has just gotten even better. The other star product of the collection is the Guerlain Meteorites Happy Glow Blush, Guerlain’s first pressed powder Meteorites blush. It’s exceptionally pretty, borrowing some of the ‘Rainbow Glow’ technology from the Meteorites Happy Glow Pearls to create a rosy flush with a dimensional sheen. The shimmer is micro-fine and as sophisticated as you’d expect from Guerlain, it brings a touch of youthful freshness to the blush. The three pressed pearls that make up the blush are the aforementioned ‘Rainbow Glow’ pearls, plus a sweet shade of rosy pink, and a small smattering of reviving fuchsia. The overall effect is clear, fresh and really beautiful. It instantly lifts your look. Lips are given the same rosy treatment as the complexion with two brand new shades of Guerlain’s iconic KissKiss Lipstick. KissKiss is a classic, creamy satin lipstick that caresses lips with nourishing and pigmented colour. 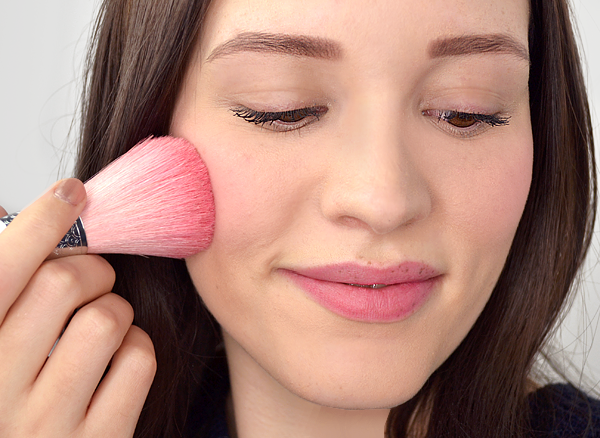 It’s the perfect formula for post-winter lips… it’s a really forgiving formula! 564 Pearly Pink is a cool-toned rosy mauve shot through with micro-fine shimmer, while 565 Blossom Glow is more vibrant, offering a neutral-to-warm rose hue that’ll liven up your smile. What do you think of the Guerlain Happy Rosy Glow collection? This entry was posted on Wednesday, January 4th, 2017 at 5:03 pm and is filed under Make-up, New products, Swatches, Tried & Tested. You can follow any responses to this entry through the RSS 2.0 feed. You can skip to the end and leave a response. Pinging is currently not allowed. The collection is incredible isn’t it? It’s the epitome of dressing table eye candy! Argh, yes, I’ve been eagerly awaiting your post since I saw this collection on your Instagram, as it looked sooo pretty. Had no idea it was exclusive to escentual. Everything looks superb, really nice, pretty, Spring colours and the packaging is tdf. 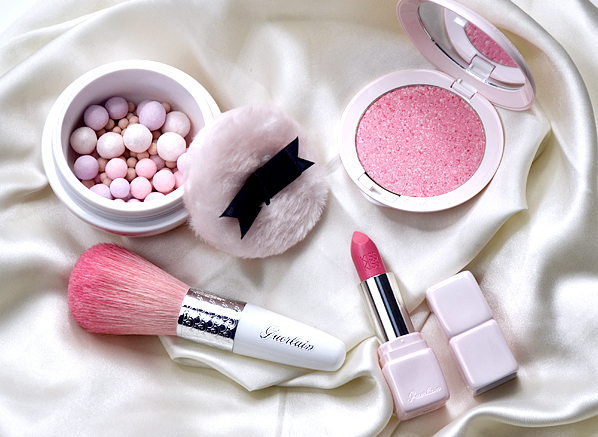 Loving the fluffy puff with the pearls and really keen to try the pressed compact powder and how beautiful those lipsticks (inside and out) are. great post and pictures! You made me buy everything! I’ve never bought an entire collection!